The event attracted people and boats. And several drones. Early in a gorgeous morning, the noted maritime photographer Jonathan Atkin showed up with the Atkin Drone Team which included Ben Wolf as Director of Photography, and Bryson Jenkins working as Videographer/Editor. After getting all the official permissions in order, the Three Dronesters donated time and resources to shoot and edit this inspiring video of our move. The NY Media Boat was there taking photos, and John Bowie of Vane Brothers, the company which donated the towing services, thought that moving the MARY was so historic that he came out in Vane’s launch to witness and photograph it. Thank you John Bowie and Vane Brothers for the tow and the photos! The cheerful band aboard the MARY included some board members, some donors, and several of our volunteers. Our finance guy Dan Goncharoff volunteered to be line handler; he stayed ashore to cast off lines at Pier 9B and catch them at Pier 11. The only unhappy party was the ship cat Chiclet who gets locked in the head (bathroom) when the MARY is under tow. Councilman carlos menchaca and portside president carolina salguero soon after docking. Vane’s tug QUANTICO CREEK had tug and tanker “nose to tail” (bows and sterns of the two boats facing different directions) so that the tug could position us in our new spot without changing how the tow was made up (how the tanker was tied to the tug). We swung out into the Buttermilk Channel where the view of Manhattan, as familiar as it is, caused excitement and lots of smartphone photos; and then we passed under the gantry cranes of the Red Hook Container Terminal which cast big shadows across us and our path. Another vessel was still in our intended spot due to engine problems until a tug moved them, and the two tows passed inside Atlantic Basin. 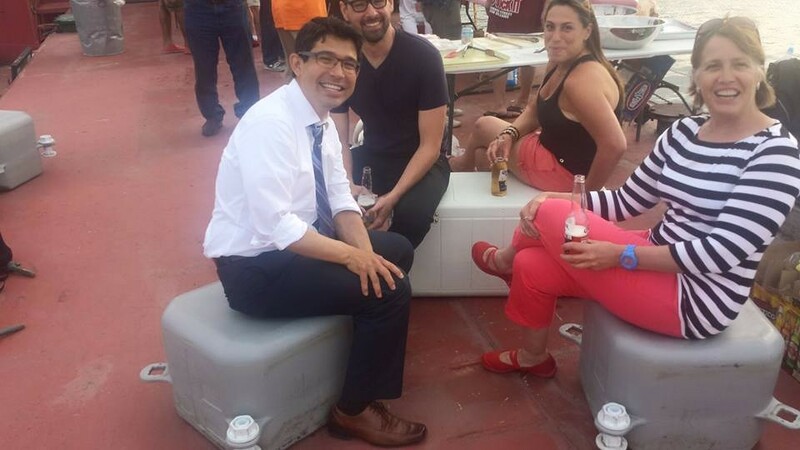 Soon after docking, Councilman Carlos Menchaca popped by on his bike. Carlos did much to secure PortSide this new home by including us in his LOI with the EDC about SBMT. How’s that for the alphabet soup of waterfront planning! 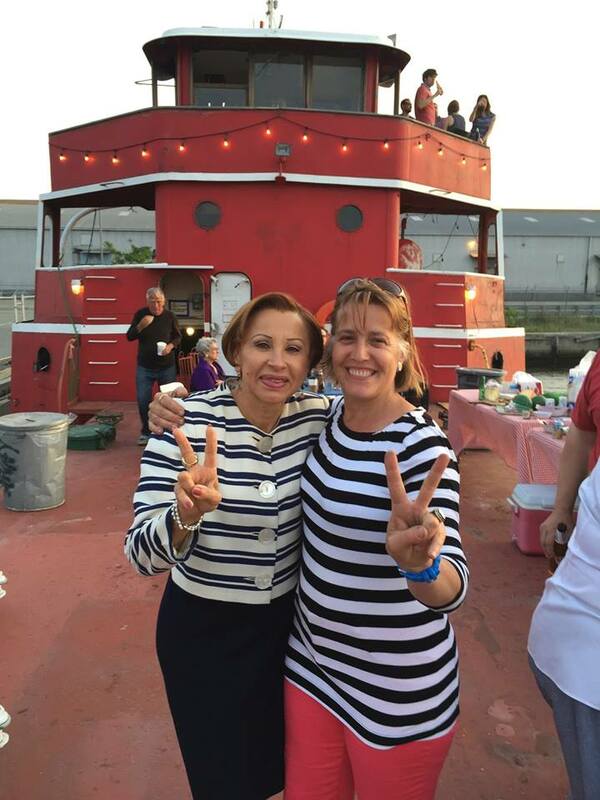 PortSide ended the day with a party for joyful core supporters including our volunteers, our board, prior sponsors and some elected officials. 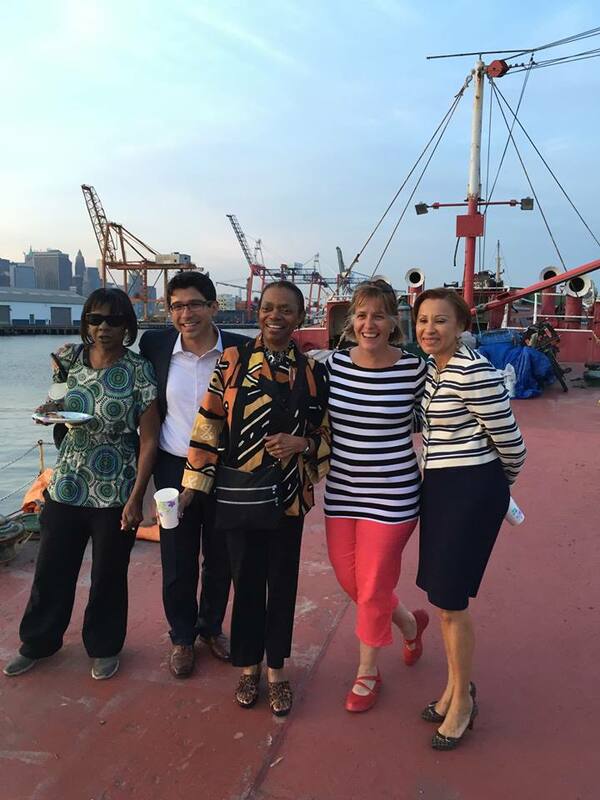 It was great to have aboard again Councilman Carlos Menchaca, NYS Senator Velmanette Montgomery, and US Congresswoman Nydia Velazquez. NYS Assemblyman Felix Ortiz, who has been aboard before, was represented by Karyn Broughton. A la PortSide we often repurpose maritime stuff, and for this party we inaugurated the use of candock segments scattered around the deck as sectional seating. Special thanks to energetic volunteer Jonathan Miller, who thought he was going to grill for a handful and ended up cooking BBQ for hours and feeding many of Red Hook’s political representatives. The food was delicious! Of particular joy to the PortSide crew was that the MARY was immediately visible and people began to walk up and ask what was going on, what was this ship. PortSide NewYork is planning a fundraiser and inaugural programs for our Atlantic Basin home for the second week of August. Want to get involved? You can donate, volunteer, join the fundraising committee, or suggest an idea by sending us an email. The tanker MARY A. WHALEN is now docked here at the south end of Pier 11 in Atlantic Basin, Red Hook, next to the Brooklyn Cruise Terminal. Atlantic Basin is where the Red Hook Crit takes place, and we are right on the Brooklyn Greenway. We are kitty corner from Pioneer Works, step out their door, and look to the left. Pedestrians and bikes can enter at the corner of Pioneer and Conover Street, and vehicles enter the cruise terminal gate at Bowne & Imlay. Nearest bus stop is the B61 stop for Pioneer Street. Exit the bus, take a right on Pioneer, walk to end of Pioneer at Conover and enter the gate. The nearest subway is the Smith & 9th St F/G stop. Here are walking directions from that stop thanks to hopstop.